Udupi : Hephsiba Rani Korlapati took charge as the Deputy Commissioner of Udupi district at the District Offices Complex here on Thursday. 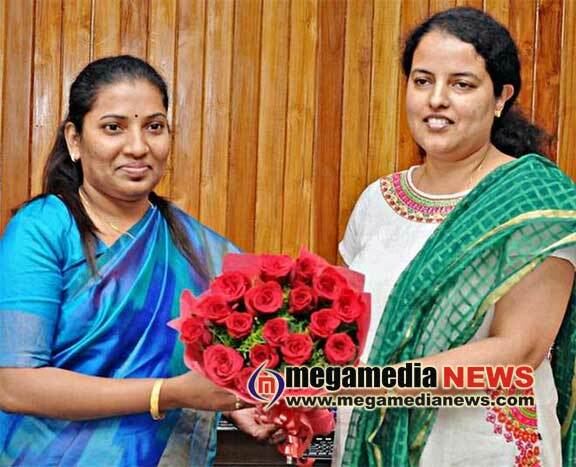 Priyanka Mary Francis, who has been transferred as Director of Tourism, Bengaluru, handed over the charge to Ms. Korlapati. An IAS officer of the 2011 batch, Ms. Korlapati completed her graduation at College for Women, Osmania University, Hyderabad. She did her postgraduation in geography from Delhi School of Economics, University of Delhi. She secured the 20th rank in the All India Civil Services Examination in 2010. She served as Commissioner (probationary) of Mandya City Municipal Council. Later, Ms. Korlapati served as Assistant Commissioner, Basavakalyan, Bidar; Commissioner of Basavakalyan Development Board; Commissioner of Mangaluru City Corporation, CEO of Chamrajanagar Zilla Panchayat, and Managing Director, Special Purpose Vehicle (SPV), Hubballi-Dharwad. The outgoing Deputy Commissioner, Ms. Francis had served as CEO of Udupi Zilla Panchayat from November 17, 2015. She took charge as the Deputy Commissioner of Udupi district on February 23, 2017.